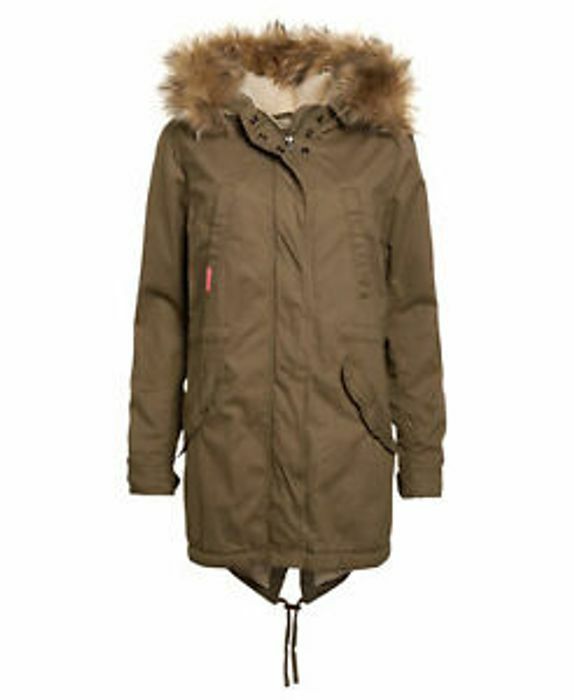 "Superdry women's Heavy Weather Rookie Fishtail Parka coat. The Superdry take on a classic mod design, the Heavy Weather Rookie Fishtail Parka coat takes 50s military inspiration and adds a contemporary touch. The coat has a hood with a detachable faux-fur trim, a full length zip and popper fastening, popper cuffs and four external pockets. Inside, the body and hood are lined with faux-fleece with a drawcord to accentuate the waist. The Heavy Weather Rookie Fishtail Parka coat is finished with a Superdry logo on the right chest pocket and a flag logo patch on the left sleeve." Yes it is really cold again isn't it. Even if it was warm this is worth a punt ready for next year.